As US gambling legislation produces new sports betting states and markets for legal sports wagering, more and more prospective bettors will have the long-awaited opportunity to join one or more now-legal “cash entry” football betting contests. Such contests have a rich and vibrant history in the world of sports wagering and continue to occupy a somewhat understated historical position in the massive explosion of sports betting interest and wagering that followed. 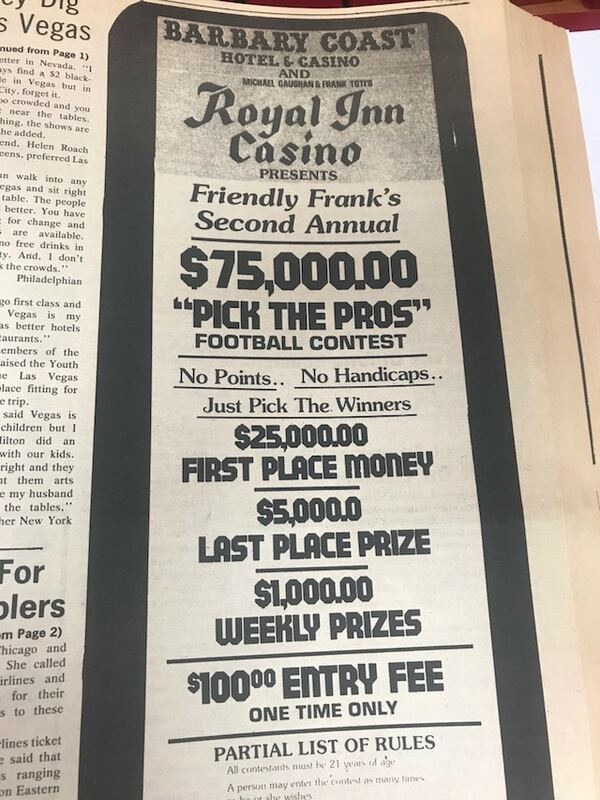 Also emerging in that year in Las Vegas was a mass-appeal, no-spread football contest called “Friendly Frank’s Pick the Pros” at the Royal Inn and the Barbary Coast, operated at the time by current South Point owners Michael Gaughan and partner Frank Toti. The entry fee ran $100 with a cash prize of $25,000 for the entrant picking the most winners over the course of the NFL season. The entrant who picked the fewest number of winners received $5,000. Forty years later, many of the elements Reizner’s contest are an integral part of the Westgate Las Vegas SuperContest, and the Gaughan/Toti concepts are still in play at most of the Boyd Gaming casino/resorts in Las Vegas. Reizner, almost always nattily attired in a sport coat and tie, ran the hole-in-the-wall book at The Castaways, one of the early hotels in Las Vegas. The Castaways, along with the Stardust and the Union Plaza, casinos marked the beginning of the migration of the standalone sports and racebook into mainstream Las Vegas, with designated spaces inside prominent hotel/casinos on the Strip and Downtown. Eight years later, in 1986, $137,000 was up for grabs in the contest and in 1987, The Castaways advertised a $250,000 prize pool. 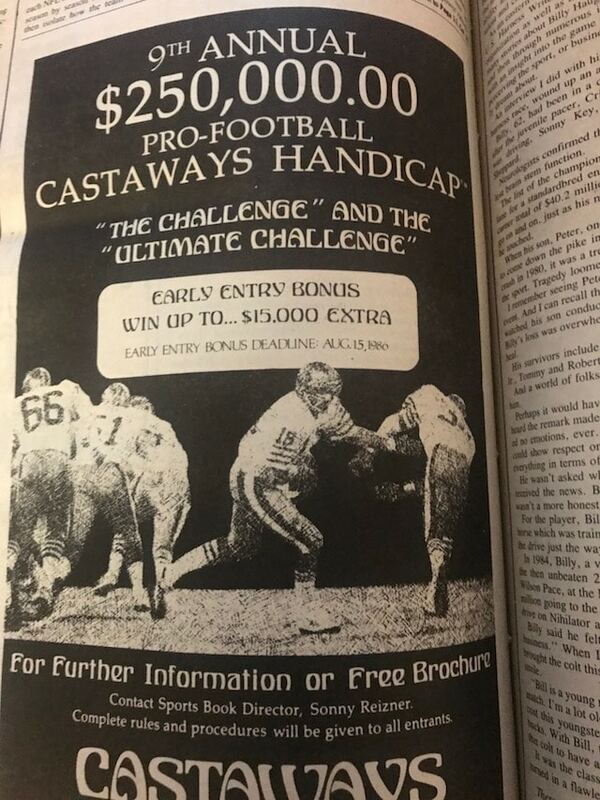 Known and trademarked as the “Pro-Football Handicap,” the contest was a promotional home run for Castaways and Reizner in particular and sport betting in general. Reizner gave out extra money for early entrants who won and even ran a preseason contest with a $50.00 entry fee at The Silver Slipper, a sister property through which he promoted his Castaways’ event. The Castaways was shuttered in July 1987 and soon demolished to make way for the construction of The Mirage, which opened in 1989, on the prime Strip frontage. Despite The Castaways’ rich history — it was once owned by Howard Hughes — most remember it for the pioneering football contest conceived by Reizner. The high price to enter The Castaways contest ($1,000) was significant and it utilized a point spread. The robust entry fee and big-buck prize pool made sure only the serious players took part. However, the ancillary benefit came when Reizner would post the various plays and consensus plays of the entrants for the public to see. There was great interest in the plays of entrants like professional gamblers Lem Banker, Jim Feist and Austin. 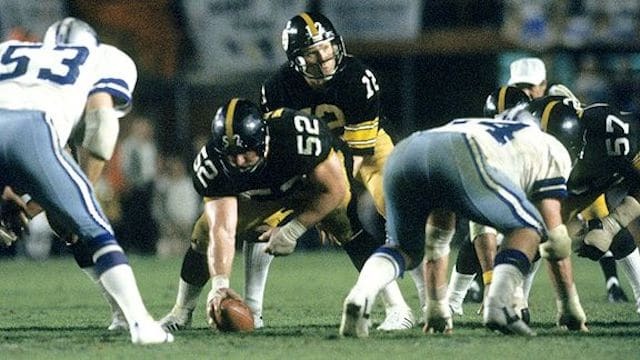 Both serious and casual players would come to the book when the plays were posted to see what games Banker, Feist and the others liked on Sunday and would then go to the windows to bet many of the NFL teams the entrants endorsed. The significance of the contest can be viewed on a number of levels. It increased interest in betting, it created foot traffic for the casino and it served as the forerunner Westgate’s Supercontest (formerly known as the Hilton SuperContest and the LVH SuperContest), in which the 2017 winner took home $1.3 million. Just like football coaches, if a scheme works, others will play copycat. Nearly every other Nevada sportsbook took a page from Castaways and Reziner’s contest and Gaughan’s, including Caesars Palace, The Imperial Palace, Circus Circus and its other outlets including the Excalibur. 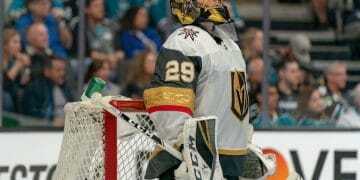 In Reno, the Cal-Neva as well as other sportsbooks gave Northern Nevadans a chance to get in on what was becoming a highly competitive segment of the sports betting business. Entry fees varied and so did the rules. Some had point spreads, others did not. Local taverns also began contests, offering up cash and prizes to customers who picked the most winners each week. A perfect card against the point spread and including some totals, especially on the Monday night game could net a participant $10,000. Newly opened casinos in Mississippi in the 1990’s also began contests, and just like the local taverns, entry was free to avoid any problem with state regulators. A contest was also offered at least one Trump property in Atlantic City. Because it was free to enter, as were contests at Nevada taverns, it was not illegal. Over the years, some sportsbooks targeted casual players by lowering the entry fee and guaranteeing a bigger prize pool that offered bigger money for weekly winners, as well as total regular season handicapping performance. Gaughan and Toti opened up the football contest for everyone by gradually reducing their initial $100 entry fee and emphasizing that no point spread was used. Now, even the most casual player could get involved and dream about the “Pick the Pro’s” big cash awards, if you were the lone weekly winner or if you had the most wins at the end of the season. Entrants soon found out that even without the point spread, picking NFL winners is infinitely more difficult than it appears. When Gaughan sold the Royal Inn, his hugely popular contest moved to the Barbary Coast on the Las Vegas Strip and as Gaughan and Toti’s Coast Casinos expanded to include the Gold Coast, Suncoast and The Orleans, this contest and the one offered by Station Casinos became a bonanza for the weekly and season-long winners as well as for the casinos because of the high player traffic they generated. Local Las Vegans saw contest hysteria ramping up throughout the 1980’s and beyond as the all the major local-centric operators, which included Boyd Gaming, as well as Stations Casinos and Coast Casinos, targeted residents through these contests. 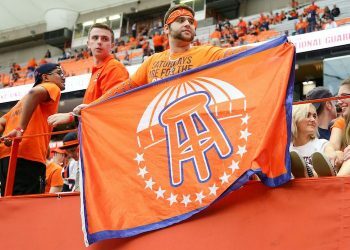 All of the properties gearing their marketing towards locals rewarded the best handicappers with multiple entries costing less money with a chance to win as much as $25,000 in a weekly contest as well as a prize in the $100,000 range for the most wins over the course of the regular season. Just one entry in one of these contests could be as low as $25.00 for the entire season. Often, if a player bought four, they received a fifth one free. In the 1990’s it was not uncommon at a Station, Coast Casino (before its merger with Boyd) or a Boyd property to have long lines late on Friday night as the bowling leagues wrapped up for the evening and the bowlers would adjourn to the sportsbook to put in their selections. 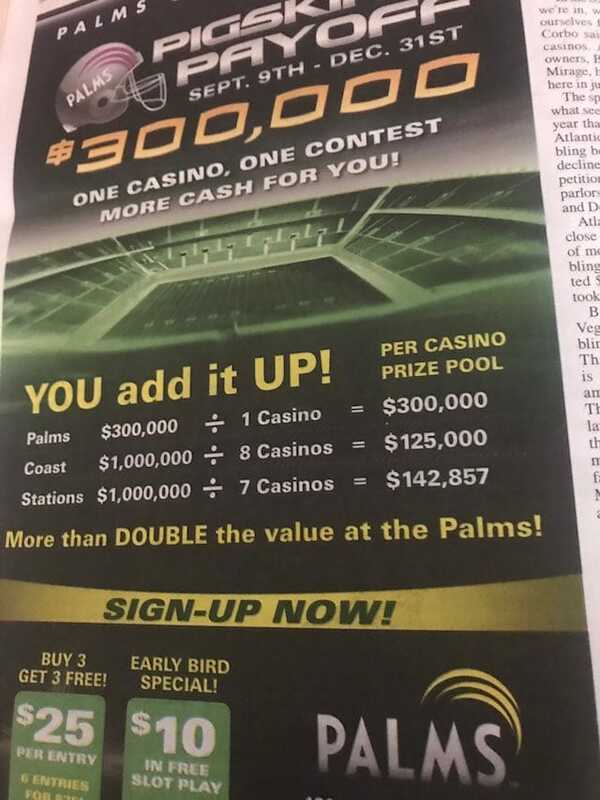 The contest concept spread to free contests for employees at many casino/resorts and was used as a team-building incentive and further helped plant the seeds for today’s massive sports betting handle in Nevada. The season-ending prize was based on total wins, thus requiring entrants to visit the casino each week to enter. If you missed a week, it was impossible to win the big, year-end prize because a “no play” was considered a loss. Stations took the contest idea to a new level with cash prizes for the player(s) with the most losses and those who came closest to having half correct and half wrong, calling it “Fiddle in the Middle.” Stations for several years offered a free house option as first prize for the most winners, if the winner wanted that instead of the cash. That’s right, you won an actual house if you wanted that instead of the cash. Syndicates created teams of entrants coaxing friends and relatives to enter and would submit hundreds and even thousands of entries each week, a practice technically against the rules, but impossible to enforce. Today, contests remain in vogue in and around Las Vegas. Participants usually are required to use a kiosk to make their bets, thus making syndicate action a little less significant. However, just as when they were conceived forty years ago, it takes more than a little luck to win. The Westgate’s SuperContest even promotes the option of proxy play, in which an entrant can designate a friend or a proxy service to make the plays in place of the registered entrant. Using a proxy allows an entrant to visit Las Vegas to register and then make the selection from another state or country. If there’s a way to make a contest bigger and better, Las Vegas will think of it. Next time in Part II: what you need to know and consider when entering a new “cash entry” football contest where you live. Robert H. Mann, a 31-year resident of Las Vegas, is the industry writer and columnist for Gaming Today newspaper and GamingToday.com. His opinions are his own and may not reflect those of Sports Handle.